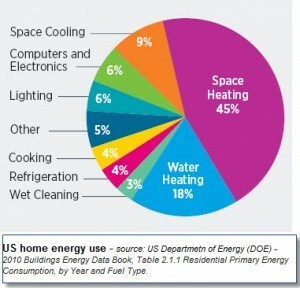 According to the Buildings Energy Data Book 2010, space heating accounts for about 45% of our home utility bill and together with space cooling they sum up to 53% of electricity expenses. Around half of space heating needs and double the amount of energy for space cooling comes consumption for water heating at about 18% of total energy consumption. Computers and electronic appliances, lighting needs and other miscellaneous energy needs account for 5% to 6% of the electricity bill each, and a total percentage of 17%. Finally, we consume the remaining 11% in the kitchen as shown in the pie chart (cooking, refrigeration and wet cleaning). Of course the presented pattern is only representative of averaged values which are influenced by geographical and climatic factors across the country. It is thus advisable that these figures be used where similar- averaged climatic / environmental conditions apply – alternatively you can search for a more applicable pattern representative to your local environmental conditions; for example southern locations will have a different ratio of space cooling to space heating with cooling accounting for a higher portion, whereas northern locations should exhibit the opposite effect. In general, acknowledging your energy consumption pattern and behaviour is a first step in realising how you consume energy and how you can adopt energy saving behaviour. Though assessing your energy performance and energy use in detail and accurately may entail detailed engineering principles (undertaken by energy auditors for a professional energy audit), you can always conduct a simple home energy audit by yourself to gain a basic insight of your energy consumption; by performing simple checks in all energy usage areas you can identify potential corrective measures for saving energy and money. If you worry that reducing your energy consumption will result in ‘painfull’ expenses for acquiring expensive energy-efficient equipment, or investing in costly energy-management-systems or undertaking consulting fees, perhaps you should relax and re-consider. Before rushing into conclusions or unnecessary actions you can consider some zero-cost energy saving tips; they have zero-cost and they can save you energy and money. For more energy-saving-tips, refer to our green-tips category or to conservation of energy section.